It was my last day of work. We had plans to begin our twelve hour drive to Myrtle Beach the following day and I was crazy busy trying to get everything done at work. Our travel plans were abruptly put on hold when we got the call from daycare that Jillian was sick and that we had to come get her immediately. It all started off with an innocent phone call to Jillian's daycare to check up on her. I always make it a point to call at least once a day. That afternoon I called around 3pm to see how my baby girl was doing. Sadie, Jillian's care giver that day, told me that she was doing well and had just finished up a bottle of breast milk. She had also just been changed and was playing in one of their jumperoo's. Sadie casually mentioned that Jillian has developed a heat rash on her belly and asked me if I had noticed it too. I told her that I was the one who had changed her diaper that morning and didn't notice anything unusual. She said she would keep an eye on it and it could have been from her playing on the floor. I didn't think twice about the rash and went back to finishing up my work. Work was insanely busy for me that day because I had a huge to-do list that I wanted to to knock out before we left for vacation. A few minutes later, I took a break from what I was working on and went to go pump. I still pump in our company's lactation room twice a day. I had already put it off long enough that afternoon since I was so busy. I arrived back at my desk and noticed that the red light on my desk phone was lit indicating that I had a new voicemail. I actually had two, one from Jillian's daycare and one from Jeff. The message from daycare was from Sadie telling me that Jillian had become ill and needed to be picked up immediately. The second one was from Jeff wanting to know where the heck I was and that he had left work to go pick up Jillian. At that point, I was so worried and upset for my daughter. I felt helpless being stuck at work, so far away from where she was. I had no idea what was going on and why she had to be picked up immediately. I decided to call Jeff back first. He was quite upset when he answered his phone. He told me that Jillian had developed a rash on her stomach and had hives all over her body. She also was experiencing a severe runny nose, labored breathing, and was itching her skin so much that they had to put little socks on her hands so she wouldn't hurt herself. She had also been crying so hard and wouldn't stop which was also affecting her breathing. They had to take her outside in fear of her infecting the other children with whatever she had come down with. Jeff told me that he would call me as soon as he could and for me to head home as soon as possible. My mind started racing, thinking about what it was that could have possibly made her so ill. A few weeks ago, the chicken pox along with hand, foot and mouth disease were going around daycare, however, that had pretty much fizzled out from what we were told. I started thinking about all of her symptoms and it sounded to me like it was an allergic reaction to something. I recalled that we had sent Jillian to daycare with a bottle of new formula that we hadn't tried at home yet. It was still the Enfimil brand, just not the Gentlease that we had been giving her. It was a sample that we had gotten from our pediatrician and thought we would try it since we were out of the Gentlease. I called Jeff back to see if he could ask daycare if they had given her this bottle of formula yet. We usually send three bottles of breast milk and one bottle of formula. We have them save the formula bottle for last because they usually do not end up using it and will give it back to us when we pick her up in the evening. We then will use it as her bed time bottle. That bottle of formula was the only thing different in her day that I could think of. Jeff called me back a few minutes later saying that Jillian looked terrible and that he was taking her to Hillcrest Hospital. Hillcrest is a Cleveland Clinic hospital and the only one in the area with a pediatric ER. She was also born at this hospital so we were already familiar with it. It was 5pm and I was no where near finishing up my work for the day. I went into my bosses office and let him know that I had to unexpectedly leave early and that Jillian was being taken to the ER. I told him that I would log on in the morning to wrap everything up. I then ran out the door and headed to Hillcrest. I called Jeff while I was in the car and started asking him a million questions. How was she? Was she breathing OK? 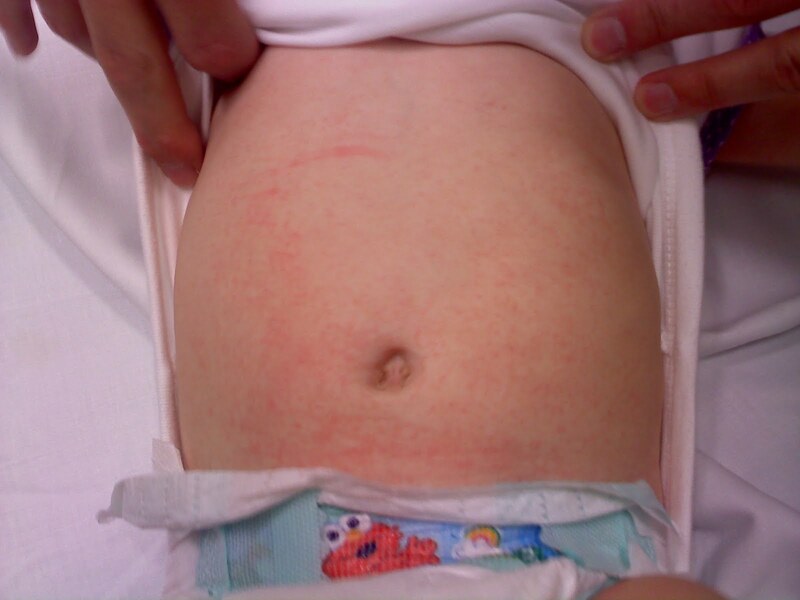 What did the rash look like? Did you ask about the formula? Does it look like an allergic reaction? He said her hives were not as bad as they were when he picked her up and that she had fallen asleep in the car. He kept trying to wake her to make sure she was OK. He also mentioned that they had already given her the formula bottle but wasn't sure at what point during the day. Jeff arrived at Hillcrest before I did. As I pulled in, I saw that his car was still sitting in the entrance to the ER. It was obvious that he did not care about finding a parking spot and just left his car in front of the entrance. I am sure I would have done the same thing. I quickly found a parking spot and ran inside. 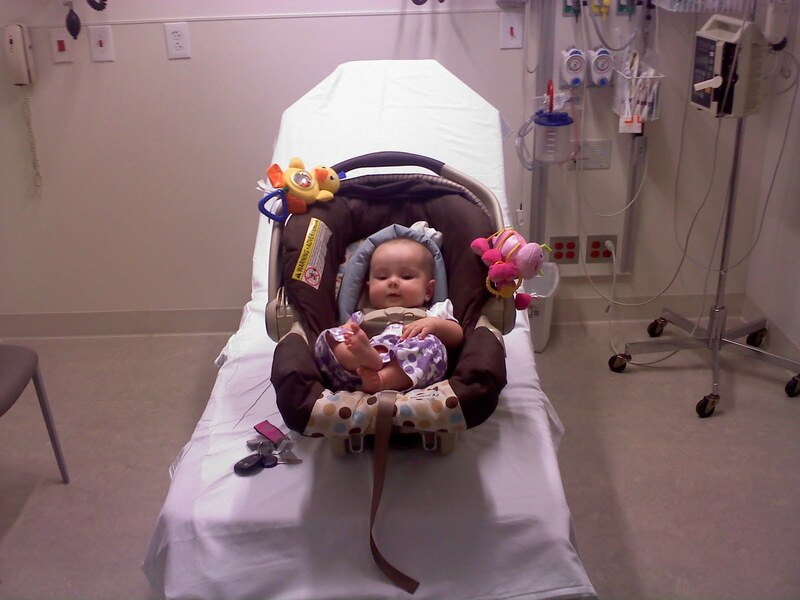 I saw Jillian sleeping in her car seat while Jeff was speaking to several of the nurses about her symptoms and why we were there. I interrupted them as soon as I walked in and asked if I could take Jillian out of her car seat. They said she was fine and that I could. I removed the harness and gave her a huge hug. She was still asleep and I just held her crying. I felt so bad for her and felt so guilty for not even knowing what the heck was going on. I could barely answer any of the nurse's questions because I really only heard part of the story from Jeff. At that point, she looked visibly fine. She had one remaining hive on her forehead that was fading. Her nose was all crusty and she still had a slight rash on her abdomen. She finally woke up and gave me a big smile. She was breathing fine and didn't seem to act like anything was out of the ordinary. After we answered all of the nurse's questions that we were able to they put us in a little screened off area and told us to wait for the Pediatrician on call. Jeff and I sat on the little bed trying to figure out what the heck happened. The only thing that it could possibly have been was perhaps the new formula but really didn't think that would cause such an extreme reaction. Especially since we have always given her Enfimil formula. Now that we were more calm and just waiting for the pediatrician to show up, we tried calling daycare to see if their was more information that they could provide to us about what happened. Unfortunately it was past 6pm and they had all gone home for the day. The pediatrician finally showed up and started asking us more questions. We explained what had happened at daycare and that we decided to bring her in because of her labored breathing and to get checked out. We told him about the slight possibility that it could have been a formula allergy and that chicken pox and hand, foot, and mouth were going around. He ruled out all three and told us that her rash, the only remaining symptom, looked like a viral rash and that there was nothing to do for her. We were to call our pediatrician in the morning and make an appointment. He continues to tell us that based on our vague story on what happened, he could only diagnose her based on what he was currently seeing and that the rash and dried up nose looked like a virus to him. I was so annoyed by that point, even I could tell that it wasn't viral. Her symptoms had come and gone within a matter of hours. You could already see that she was returning to her normal self. She didn't have a temperature and didn't have any other symptoms that I would think to be viral. She was not sick. I questioned him and said are you sure it's not an allergic reaction to something? He said no, that her nose appeared to have been runny, and that it was probably viral. I said that her nose hadn't ran since her symptoms had disappeared and that a runny nose was also a symptom of an allergy. He said possibly but he couldn't say for sure. I was so annoyed by his lack of interest in trying to find out what happened and that he just brushed it off as a virus. So we left the ER with no answers, but with a very happy and oblivious baby. By 7pm that night, her rash was pretty much gone and she was as happy as could be. The next day I called daycare and asked to speak to Sadie since she was the one that was in charge of taking care of Jillian the day before. Sadie was awesome in walking through her day with me and trying to piece together what had happened. She also confirmed that she had given Jillian the formula bottle after she and I had talked at 3pm when Jillian's rash had already started to develop. So we concluded that it was most likely not the formula. I don't plan on giving her that kind ever again but I really do not feel like the formula was to blame. Sadie suggested perhaps it was something I had eaten and had gotten into my breast milk. I had not thought of that possibility but at this point who knows what caused her reaction. She has been fine ever since. I don't think we will ever find out what she reacted to unless it happens again which I praying it never does. I am happy to chock it up as a fluke and hope it never happens again. The unexpected trip to the ER that night delayed our vacation packing so we ended up postponing our plans to leave the next day. It was a good decision because I learned packing for a baby is nuts! But I will get into that in my vacation post. I snapped these pictures once we knew Jillian was going to be OK and wanted to document her rash before it had completely faded. Yikes- that's so scary when you don't know what's wrong with your baby. Glad everything is better! So glad she is doing better. Same thing happend to my little guy this weekend, but he had tennis ball sized hives that were hot and red. But no answer from the ER doc. Wow, I can only imagine how scared you were! I'm so glad she's okay. So scary! I'm glad Ms. Jillian is okay! I'm so glad that she's okay now, that must have been terrible for all of you!!! how scary! we've only been to the ER once (as of this moment...) and it is definitely not a pleasant experience! when your baby is having trouble breathing, that's when the fear/panic kicks in! but don't worry momma and don't feel guilty...you did EXACTLY what you were supposed and what any other momma would have done! so glad sweet jillian is okay!! Oh my gosh!! You poor thing! I am sure you were freaking out!! So scary! I'm glad she's doing better. I hope you enjoyed your vacation. Oh goodness! That is a scary experience! Sounds like you handled it like a seasoned mamma! So glad she is doing better. Oh I am so glad she is ok!! You are a great mommy! I'm glad she is OK, how scary! So hard to see your baby sick and helpless! Glad she's okay only wish y'all knew what caused it in the first place. After GG was in the hospital for a week we were discharged without ever being told the cause of her illness. So frustrating!